The spoons on this page are very big and very impressive and very detailed in their workmanship. These large spoons are designed for serving steamed jasmine rice at ceremonial events. These poor pictures hide a very impressive looking spoon, This large (over 12" 325+mm) spoon is hand made from one piece of silver. 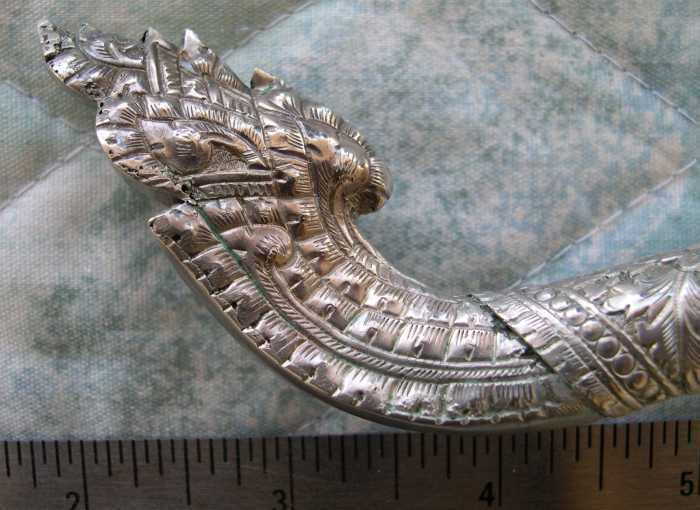 The top figure is repoussed and the handle is bent into an inverted "V" shape which has detailed engraving and chasing work down its entire length. The very unusual shape would require a 3-d picture to show it's true beauty. The dot engraving on the back supposedly indicates that it is "pure silver", but it is in characters which I can't read. I suspect that this represents the goddess Sawasdee, but this is a guess. This very large spoon is similar in overall shape to the previous spoon, but I think that it is made out of aluminum. It does show extensive workmanship but it might be factory produced, and despite its large size it is surprisingly light. The handle is an inverse "V" shape and it also has a very large "bow" in the center thus it doesn't lie flat. There is a round stamping mark in the groove on the back of the spoon, but it is in characters which I cannot read. 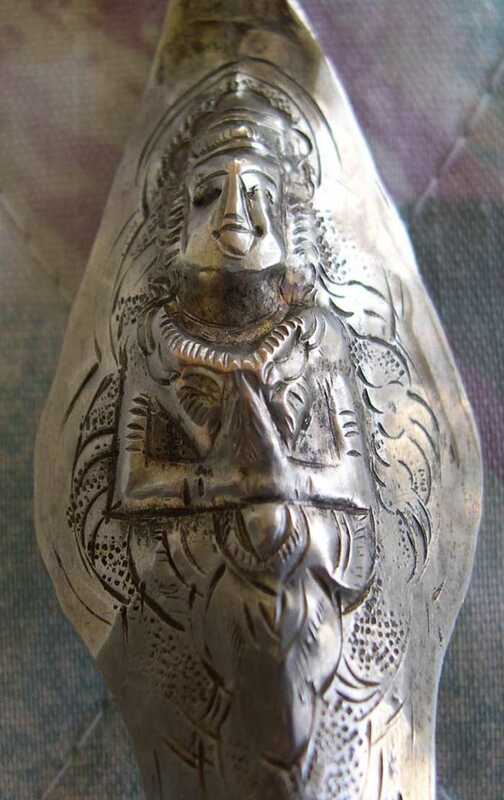 This is the finial on a very large impressive all hand worked spoon which is probably from Siam or Thailand. The finial seems to me to be a water buffalo but it could also be a Siamese version of a dragon. The handle is round and hollow and extensively chased and the large bowl is also hand worked.